Hawaii linebacker Adam Leonard's interception last night was his fourth of the season. That time in practice devoted to the "tip drill" paid off big for the Hawaii defense last night. The Warriors came up with three interceptions -- all off deflected passes -- as the defense helped set the tone for a 50-13 Western Athletic Conference win over New Mexico State at Aloha Stadium. "We practice it once in a while, we do more ball drills, but maybe those couple times we practice it, it helps out," said UH safety Keao Monteilh, who accounted for one of the Warrior turnovers. New Mexico State's passing attack kept the Warrior secondary busy and the Aggies were able to rack up 442 total yards, led by quarterback Chase Holbrook's 328 yards through the air. But the only numbers that mattered to the Warriors were those under the points column, as they kept the Aggies off the scoreboard for the first 29 minutes, giving the offense time to take control of the game, and held NMSU to two field goals and a single touchdown. "We knew they were going to get passing yards, but the way we played tonight, I was just amazed," said safety Desmond Thomas. "We came with what our coach calls a 'kick-A' attitude." NMSU's upset hopes were stifled early on as the UH defense's first six appearances resulted in two interceptions off tipped passes, two punts and two fourth-down stops, as they accomplished a few of their goals along the way. "We wanted to get turnovers. We wanted to make them earn what they got, and play good on third- and fourth-down situations," UH defensive coordinator Greg McMackin said after watching the defense allow NMSU to convert on only five of 16 third-down chances and one of four fourth-down attempts. By the time the Aggies mustered a field goal with 39 seconds left in the second quarter, the Warriors were on their way to their eighth win of the season as the UH offense pulled away. "We studied tendencies and what they like to do out of certain formations, and going against a pass offense every day was a plus for us," Monteilh said. "We were ready." The defense padded the lead late in the game when JoPierre Davis snagged a pass tipped by a New Mexico State receiver for his first career interception and returned it 57 yards for UH's final touchdown of the night. 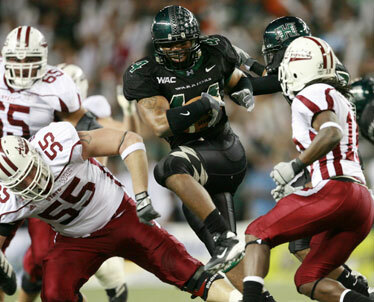 It was Hawaii's fifth interception return for a touchdown this season. "Just going for the ball hard just got me a pick and I'm blessed," Davis said. "I saw nothing in front of me and it was like when I was playing running back in high school. I was going to go score." The Warriors kept five defensive backs on the field for most of the game. Thomas started at a deep safety alongside Jake Patek with Monteilh also part of the nickel package. Dane Porlas also saw action in the secondary. After Adam Leonard pulled in a pass tipped at the line of scrimmage by Amani Purcell in the first quarter, Monteilh also came up with his second pick of the season, making a quick reaction to snag a pass deflected by linebacker Solomon Elimimian. "I was actually coming in to hit the guy and Solly tipped it and I dove and it was in my hands," Monteilh said. "The two interceptions I had (this season) Solly tipped both of them, so I told him, 'I'm going to follow you wherever you go.' "
Ryan Mouton played extensively as a nickel back in his return from a two-game absence due to a torn posterior cruciate ligament in his right knee. "It felt real good, I played a lot more than I thought I would," Mouton said. "We knew they were going to put up yards, but the big thing was points. Stopping them from getting in the end zone was the biggest key." While Mouton returned, Monteilh and Thomas both left the game in the second half with injuries. Thomas suffered a bruised quad and Monteilh's left arm was in a sling after the game due to a shoulder injury suffered defending NMSU's lone touchdown of the night.